Registration for the Mayor’s Summer Youth Employment Program Job Fair is open! 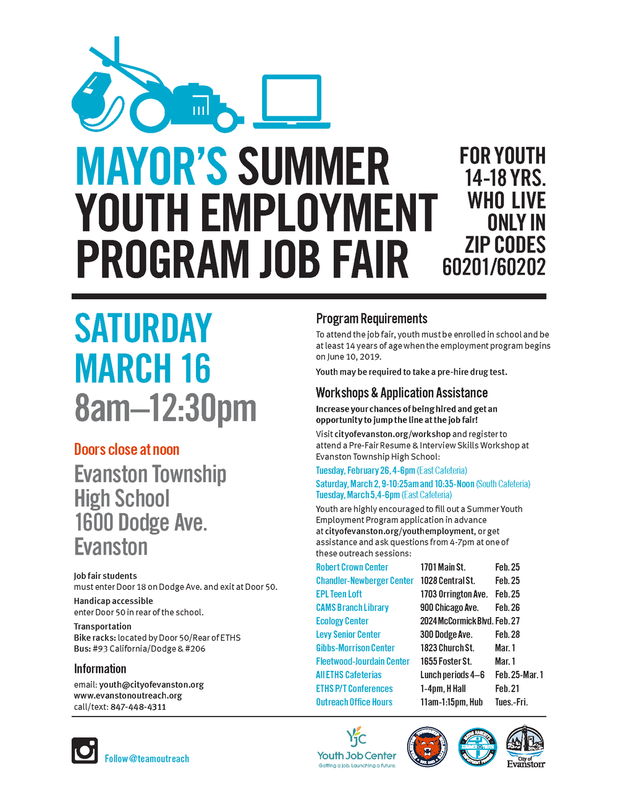 Registration for the Mayor Hagerty’s Summer Youth Employment Program Job Fair is open! To register for the event please sign up here. Please note, participation in the Mayor’s Summer Youth Employment Program Job Fair is limited to Evanston residents only. In preparation for this event Youth Job Center is providing pre-fair Job Readiness Trainings to help you develop your resume, practice interviewing techniques, and more. The first 50 youth to complete these workshops will have the opportunity to skip the line at the event so sign up here! The Mayor’s Summer Youth Employment Program (MSYEP) began in 1992, and for more than twenty years has provided skills and workforce opportunities year-round for thousands of Evanston at-risk youth ages 14-18. As a workforce development and non-law enforcement crime prevention initiative, the MSYEP emphasizes real-world labor expectations, increases the awareness of services offered by local community based organizations, and provides opportunities for career instruction, financial literacy training, occupational skills training, and social-emotional growth. The program gives participating youth up to nine weeks of entry level work experience in a variety of jobs and industries through community based organizations, city government departments, and private sector businesses.